Place chicken strips, Cajun spice and oil in a bowl, cover and set aside for 10 minutes. Heat a large non-stick fry pan over a medium-high heat. Place the chicken strips in the pan and cook, stirring occasionally for 5 minutes or until brown and cooked through. Transfer to a bowl and keep warm. Top each tortilla with Tzatziki dip, carrot, zuccini and grated carrot. Serve immediately with a green salad of your choice. It is looking nice and delicious . 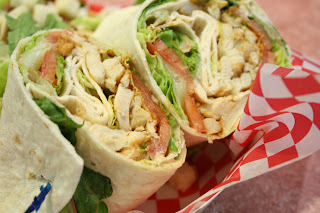 . .
great recipe for cajun chichen wrap. i had this at kfc before and it was great. i will consider making this at home this weekend! wish me luck.